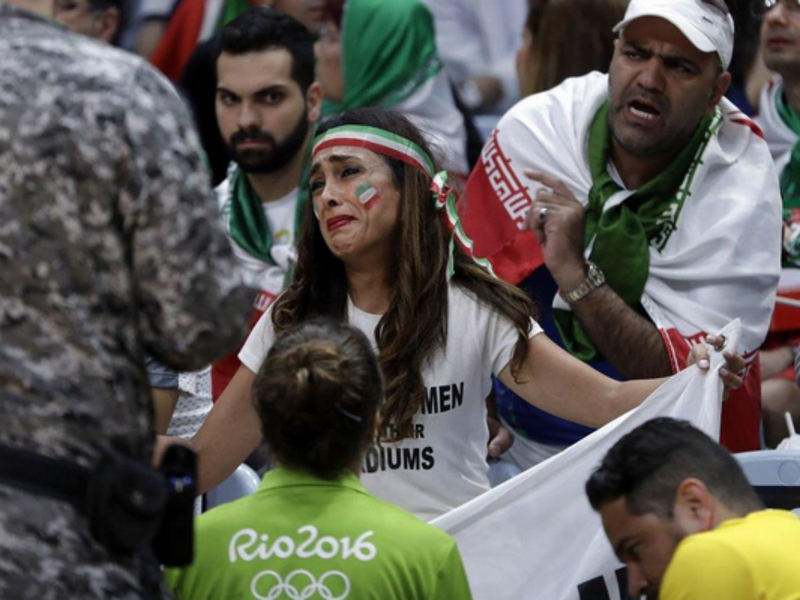 If you tuned into the Olympics this weekend you might have caught the drama that unfolded on Saturday, involving a female Iranian activist being asked to leave the stadium for raising a political banner. 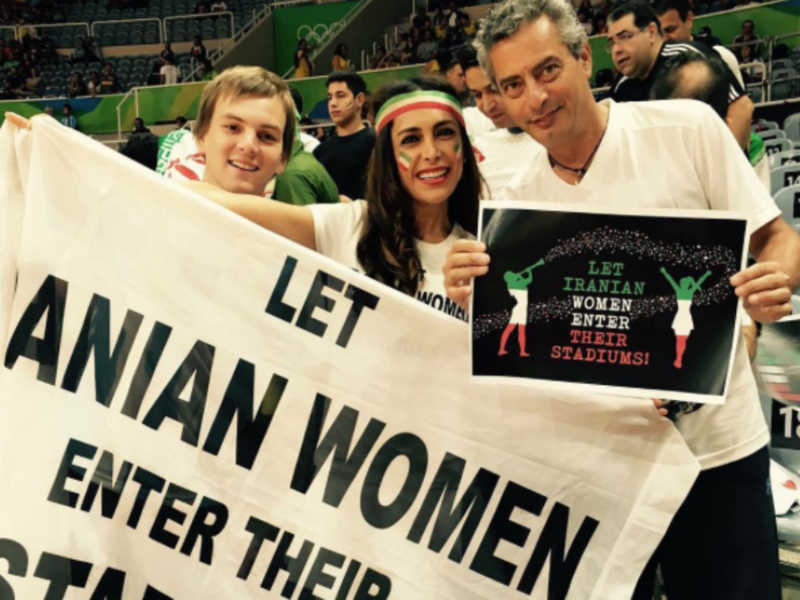 Darya Safai was asked to leave a Rio Olympics volleyball match where she was sitting front row court-side, for holding a banner that read ‘Let Iranian women enter their stadiums’, violating the International Olympic Committee ban on political signs to bring global attention to the fact that women aren’t allowed to attend male sporting events in her country. Some spectators raised their eyebrows as she refused to move, waiting for the cameras to pan away from the distraction and return to the match, thinking she was nothing but a trouble maker – they could not have been more wrong. Darya Safai is one of the most inspirational women out there, moving milestones in the name of gender equality, fighting extreme Islamism and protesting in desperation for her people. We spoke to Darya, speaker at the 2016 Geneva World Summit, before her Olympic demonstration to hear about her campaign. ‘People think that things are getting better for women in Iran’ Darya explained, ‘but every year the situation gets worse, since the revolution of 79, women have lost a lot of their rights. Women can now only be at university for a maximum of 50% of the time (before the quota, women made up 67% of the students), there are lots of subjects that women are now forbidden to study and since last summer there have been 40,000 cars that were confiscated because the female drivers or passengers were not wearing their hijabs properly. You can’t imagine what the women are going through even today and it really is getting worse. When I was in Iran we didn’t have a lot of rights and in 2012 volleyball stadiums which had previously been open to women, suddenly forbid them entrance’ Darya continued, ‘I knew that if we didn’t react there would soon be bigger problems. I decided to protest in the stadiums outside of Iran to let journalists and people all around the world know about the limitations for Iranian women. It was then that I decided to initiate a campaign to let Iranian women into the stadiums and decided to go all around the world whenever the national team of Iran was playing a game. 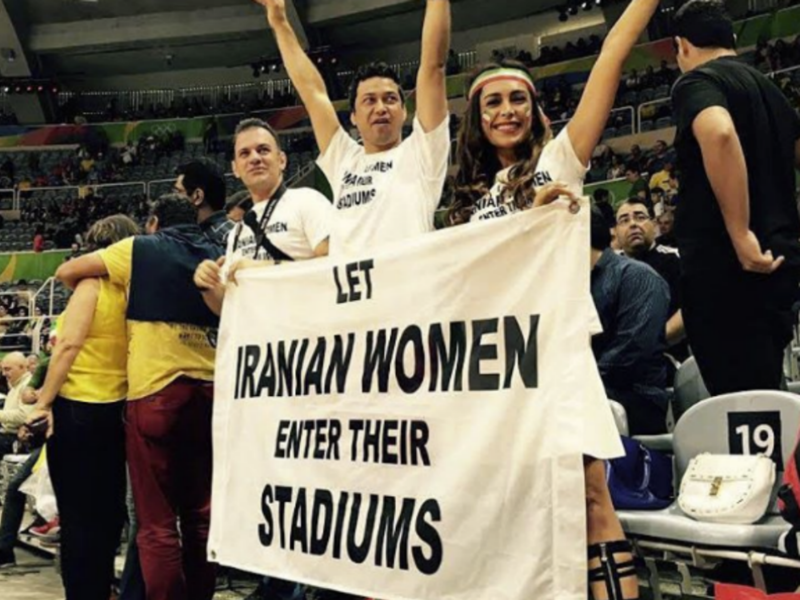 We wear t-shirts saying “let the Iranian women enter their stadiums” and hold big banners which of course attract lots of attention. The goal is to encourage the world to put more pressure on the SIVB (The World Volleyball Federation) to do something about our exclusion, something that goes against their law that any kind of discrimination in the stadiums is forbidden. Iranian women are trying to protest inside of Iran but it is very suppressive, every little protest is a jail sentence but still they wait at the doors of the stadiums to ask for entrance. It’s important to make people aware that such a thing exists in the 21st Century. The oppression and suppression of Iranian women and other women in Muslim countries is not only those women’s problem but the whole world’s problem. World peace is threatened by extreme Islamism and speaking out for women’s rights is fighting that. We should help them as a symbol of all discrimination. Through this campaign I’m not only protesting the stadium ban, I’m protesting the bigger issues too. We don’t have the right to divorce, we don’t have the right to study, we don’t even have the right to work or travel without the permission of a husband. If that’s not worth breaking an Olympic rule for, we don’t know what is.